You remember Nero — guy supposedly fiddled while Rome burned. 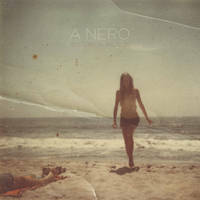 Well, I’m casting my vote for A Nero to be the house band when Brooklyn meets its inevitable end. But until that time, we have their excellent album Hysterical Fiction to enjoy. Genre-wise, I’ll categorize this as dreampop, with an overall dream-like quality, and the ethereal vocals of titular hero Annie Nero as the through-line. Adding to the lullaby mood are mellow background ooohs and ahhs and oh-a-whoa-a-whoa-ohs. And yet, it would be unwise to place this band in one neat box, because there’s much more going on here. A Nero continually utilize a diverse and dynamic sound palette. It’s no surprise that noted guitarist and producer Josh Kaufman — Ms. Nero’s husband — is a fellow band member. He’s previously appeared on record with acts including The National, and as a producer is even more in-demand, working with everyone from Craig Finn of the Hold Steady to Bob Weir. Hysterical Fiction‘s opening track “Sleepwalker” kicks off with an insistent drumbeat from the always dependable Brian Kantor (who has played and toured with Nina Persson of the Cardigans, Vetiver, etc.). While it’s probably the most straightforward “rock” rhythm on the album, the song’s woozy, unhurried mood ultimately lands things closer to shoegaze. Bonus noises here include what sounds like an extremely in-tune bee, and also a fuzzed-out guitar which says hello a time or two. Musical surprises pop up and just as quickly vanish throughout Hysterical Fiction — whenever you think you know where a track is going, it takes a sudden turn with a miniature thrill. But these touches are never random or show-off-y; everything fits precisely in the mix as part of the album’s cohesive tapestry. Every song offers something new. At its core, “Watch Over Us” feels like a forgotten early-70s singer/songwriter gem, but A Nero dress it up into something more. (Jim Smith, Nate Martinez, and the artist Kara Smith round out the band, all credited as multi-instrumentalists.) A ringing guitar sounds like the Edge, had he eschewed stadium bombast for indie rock. “Gold Canopy” is propelled by a bouncy bass line, likely played by Ms. Nero herself. It was while listening to this track that I noticed a bit of a Suzanne Vega quality to Annie Nero’s vocals — and this is not a bad thing. Both “Paper Man” and the piano-led “Moms (Hysterical Fiction)” have a hint of a trip-hop vibe. “Pearls, I Must Confess” (what is that, a harp? and then a banjo?) tricks you into thinking it’s an instrumental, until the vocals kick in a third of the way through. There is an actual instrumental track, “Theodore,” which closes the album. And prior to that, there are two very melodically strong selections: “Out of My Mind” is energized by a rock guitar, and “The Coin Toss” feels like the twee-pop pick of the litter here — a hit single in a just universe. Its pre-chorus refrain “Get lost, get lost, get lost” reminds you how easy it is to lose oneself in the hypnotic songs of Hysterical Fiction. I read his ‘Fortress of Solitude’ but it didn’t really do it for me. Well, bring some of that 5-Hour Energy Drink and everything will be OK.